The New Hampshire House of Representatives is the lower house in the New Hampshire General Court, the bicameral legislature of the state of New Hampshire. The House of Representatives consists of 400 members coming from 204 legislative districts across the state, created from divisions of the state's counties. On average, each legislator represents about 3,300 residents. Districts vary in number of seats based on their populations, with the least-populous districts electing only one member and the most populous electing 11. In multi-member districts, voters are allowed to cast as many votes as there are seats to be filled; for instance, in a two-member district, a voter can vote for up to two candidates. This system often results in one party winning all of the seats in the district, as the (cross-sectional) results below for the current representation attest. Unlike in many state legislatures, there is no single "aisle" to cross per se, as members of both parties sit partially segregated in five sections. The seat section and number is put on the legislator's motor vehicle license plate, which they pay for if they wish to put one on their personal automobiles, or in the case of the chairpersons and party leaders, their title is put on the legislative plate. Seating location is enforced, as seating is pre-assigned, although the personal preference of the legislator is asked, usually chairmen and those with special needs are given the preferred aisle seats. The sixth section is the Speaker's seat at the head of the hall. The House of Representatives has met in Representatives Hall of the New Hampshire State House since 1819. Representatives Hall is thus the oldest chamber in the United States still in continuous legislative use. Large arched windows line the walls. On the rostrum hang portraits of John P. Hale, Abraham Lincoln, George Washington, Franklin Pierce, and Daniel Webster. ↑ Member was first elected in a special election. ↓ If a candidate receives enough votes in two parties' primaries, they are listed as being the nominee of both parties in the general election. ↑ Member was originally elected in a special election. 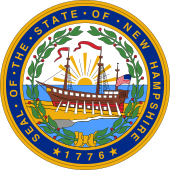 ^ New Hampshire House of Representatives "NH House Facts"